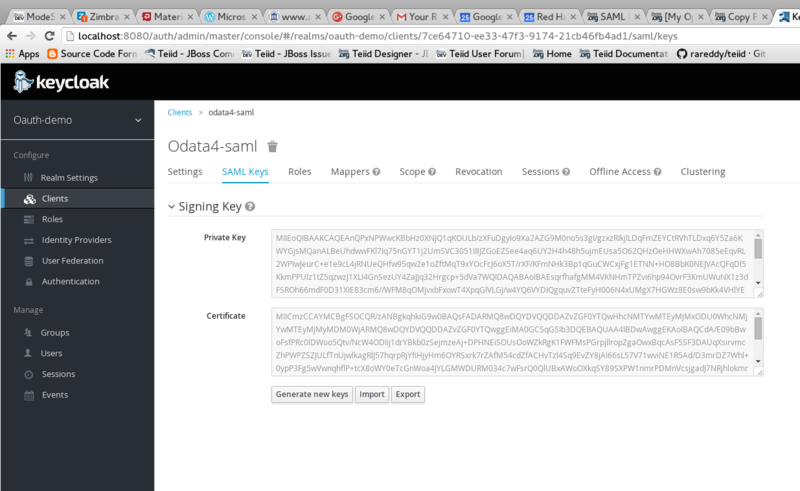 This document will provide detailed instructions to enable SAML authentication on Teiid’s OData interface using the Keycloak as authentication server (IDP). SAML is standard, so the modified OData WAR should work fine with any other compatible SAML Authorization server, however the configuration may be little different. Please consult their documentation for any such specifics of different authorization server other then KeyCloak. Tested with Keycloak 3.1.0.Final version. Click on SAML Keys, either import your certificate or generate a new one. Then click export, and keep the exported certificate for later use. Download Keycloak SAML adapter for EAP, and unzip over the Teiid server installation. Now, start the Teiid Server and using the jboss-cli.sh file run the following to install the KeyCloak confiuration into the Teiid Server. 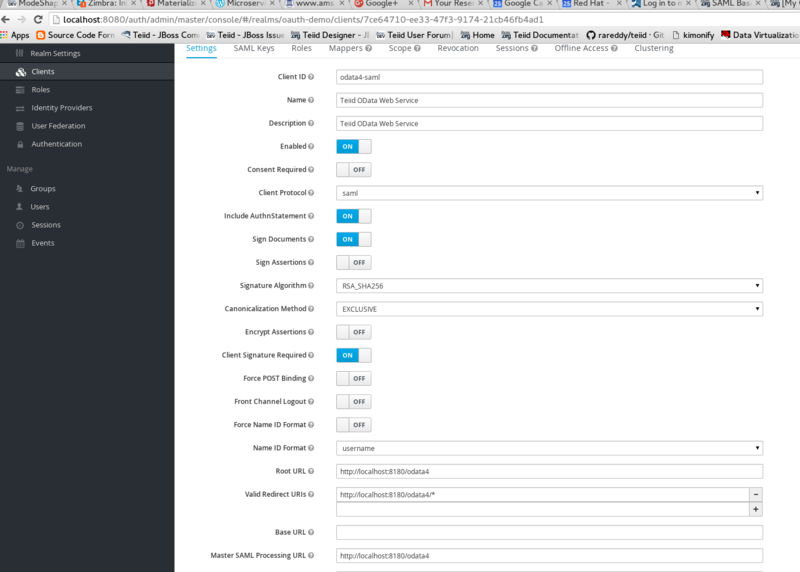 This finishes all the server side changes that are required to make SAML authentication using Keycloak. In order to use SAML authentication, the OData WAR needs to be updated to make use of the OAuth based security domain. By default Teiid installation comes with OData web service WAR file configured with "HTTP Basic" authentication. This WAR needs to either replaced or updated. Build the new OData WAR file that supports SAML. The above link provides templates for creating two WAR files, one WAR file is to create Teiid’s OData service with OAuth, the next is for SAML. Choose the SAML one. Replace the "teiid-web-security/teiid-odata-saml-keycloak/src/main/webapp/WEB-INF/keyclock.json" file contents with "installation" script in "keycloak.json" format from Keycloak admin console’s "odata4-saml" client application. Similarly replace the "teiid-web-security/teiid-odata-saml-keycloak/src/main/webapp/WEB-INF/keystore.jks" file with the exported keystore from earlier steps. build the "keycloak-saml.xml" file, and add all the sections of "metadata" specific to your service. This is where service knows where IDP located and which service this represents etc. To test any SAML based application you must use a Web browser. Using a browser issue any OData specific query, and you will be redirected to do SAML authentication.